I started as a Character Counts Coach in 2014. I have been employed at Dixon Valve for 30 years. I enjoy spending time with my family,​ karate,​ art, boating and staying physically active. In my spare time I enjoy teaching children and adults martial arts as the head instructor and owner of the Eastern Shore Isshinryu Karate School,LLC at the Kent Athletic and Wellness Center. 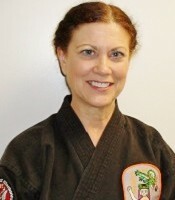 I am a student of Grand Master Phil Little and a member of the United States Isshinryu Karate Association.